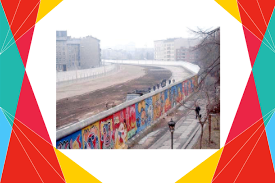 The Berlin Wall was a barrier that divided Berlin from 1961 to 1989. The Wall completely cut off West Berlin from surrounding East Germany and from East Berlin until government officials opened it today in November 1989. Crowds of East Germans crossed and climbed onto the Wall, joined by West Germans on the other side in a celebratory atmosphere. Why the wall was built ? During the early years of the Cold War, West Berlin was a geographical loophole through which thousands of East Germans fled to the democratic West. In response, the Communist East German authorities built a wall that totally encircled West Berlin. It was thrown up overnight, on 13 August 1961. The 140-kilometer Berlin Wall was in fact two barriers. The first was constructed rapidly in August 1961. The second, parallel barrier, 100 meters into the Eastern zone, was erected in June 1962. The area in between the two barriers was known as the Death Strip.